Hidden away from the dazzled eyes of the Tourists to the Gold Coast and just a few miles inland is the hinterland district. It is quite natural when one thinks of Surfers Paradise and the Glitter Strip, we think of glimmering cityscapes, bulging brown muscles amid bikini clad lovelies. That is what the focus is after all. So the area towering above and a little way inland remains a partially hidden and partially known treasure. That treasure, of course, is Mount Tambourine. The Pacific Hwy Motorway has traffic zooming to and fro, up to Brisbane, down to Sydney, Semis boom past, double B’s zipping along, creating havoc with the following winds they create, caravans pulled docilely or otherwise along with ordinary commuters in the fast lane both as a lifestyle and to get to work. Motorcycles roar along losing some of the "speed off the mark" and "maneuverability" advantages over cars as everything can go fast on the Motorway and there is no reason to slow down, like traffic lights. Even joining traffic merges to suit the speed of the motorway. And then there is the mighty Motor scooter, the scoot. I personally don't use motorways much. I am an older dude, I don't need to be in a hurry. I have a motor scooter albeit a fairly big one, more like a bike actually, and two wheels on a motorway and going slower than the usual speeds are not an ideal combination on a big time Motorway. Not that I need to apologize, I pay my Rego and taxes like anybody else and I have the same right to use the thing as anybody. I simply don't want to. Because I am not in a hurry, why take the fast lane as it were. I have the scooter because as an Arthritis sufferer it is better for me and I wished to be at one with the area I was traveling through, to see and experience more in my journey. I love the Scoot. The scooter comes into its own when I travel to places like Tambourine Mountain. I get to breathe in the freshness of the air and the gum tree aroma on a hot day, the ozone after a storm or even the wet decay on the forest floor, creating the conditions to break down the mighty fallen trees. I get to be close in the physical sense as well and ask any bike rider about the thrill the freedom of two wheels gives. If I was not, as I am, restricted in mobility by Arthritis and terminally lazy I might even ride a push bike. And where would I ride it to? Why, Mount Tambourine, of course. The area of a table plateau sitting as it does on the Coastal plains is roughly 8 kilometres by 4 kilometres of heaven for tourist and residents alike. The district has three village precincts: Eagle Heights, North Tambourine and Mt Tambourine with a combined residential population of about 6,500 with many of these being commuters to the Gold Coast area some 25 kilometres away. Unlike some of Queensland's towering geographical structures, here there is no capillary pressure spring on top of the mountain, and as the powers to be have yet to install it, there is no articulated water supply. This does not constitute much hardship, just a general caution, as the area is blessed with adequate rainfall as it forces moisture laden air from all directions up its very steep slopes to form a gentle rain. Geologically speaking the edifice, like many in this corner of Australia, originally was a lava flow from the mega volcano of which Mt. Warning is the long extinct central core. It is a big extinct volcano plug. The mountain itself has some significance as it is considered the eastern most edge of that huge area known as the Scenic Rim which was one heck of a group of volcanoes sitting atop one huge fault system in the Earth’s crust. The original inhabitants were the Wangerriburras and were soon displaced, as so often, if not always, happened, when it was realised the area had economic potential. The first lease was granted to a Mr. John O'Callaghan. It seemed a natural place for visitors, and indeed it was, so the Guest House industry soon followed. If you go and want to have an idea of just what it is you are booking, there are plenty of resources at hand on the net and elsewhere to research the accommodation scene. Such was the obvious charm and need for protection of this unique environment that our forefathers declared the land around Witches Falls as Witches Falls National Park in 1908, the first in Queensland. Witches Falls National Park is now incorporated into the much larger and diverse Tambourine National Park. The area does produce crops on a small scale and there are plenty of roadside stalls to purchase the kiwifruit, passion fruit, avocados, rhubarb, apples and mangoes. If you like walking trails there are many and varied to choose from. If like me you prefer a less energetic way to get the most from your visit, there is a Trolley car style tourist operation offering a variety of tours in sit down comfort. The system features a hop on-hop off route that allows you to see as much or as little as you wish. Its a great idea. When you do hop off you can be refreshed in any manner of ways in any number of places as coffee shops abound, and if you care to, take advantage of the wine tasting. Yup, they have grapes even up here. Mount Tambourine, or Tambourine Mountain as it is officially called, is a great place for a day trip or short holiday and makes a fantastic change to the attractions way down below in Surfers Paradise. It even has interesting wildlife. About twenty five years ago I was in Surfers Paradise attending an industry seminar and convention week. I was working for a Charity and the occasion was under the auspices of the Australasian Fund-raising Institute. I was not alone as we had a contingent of about six over from South Australia, and just to let you know, I hate these things. So there I was in Surfers Paradise and the boss's secretary a lovely woman who eventually became CEO of the South Australian Branch of the organisation. Ann had never been to the Gold Coast before and I volunteered to show her the hidden bit called Mt. Tambourine. So we jumped into my car on a rest day from the itinerary and headed west toward O'Reilly's which is a well known resort and luncheon spot. O'Reilly's is not a flash and glitz place but one of the first eco-tourist venues for that time, the mid eighties. I had been here before showing my family the very same thing eight or nine years before that. On the way is a magnificent lookout spot on the western side of the road with magnificent views towards the Scenic Rim, which we shall explore shortly. "and here in the dense and dangerous forest in central Africa is the deadly Bongo Bongo python which as you can see is at least the size of a man’s thigh, maybe more." Well, this particular Reticulated Python was at least two thighs and I have large thighs at that. The odd thing was the python didn't seem to give a hoot about the two humans standing almost on top of him, and there was a large swollen area behind his comparatively tiny head. The swelling was caused by the very recent ingestion of a poor woodland critter I took to be, from the size of the extended body, a mid sized rock wallaby. He was well fed and couldn't give a damn about anyone or anything. As I may have said before, for a man of comparatively small experience of the great outdoors I have seen many interesting things. Naturally for Ann's sake I mentioned the snaky fellow's presence in a most nonchalant way as if I saw such things on a daily basis. I doubt that she believed me. 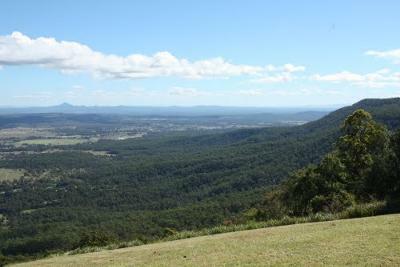 Tambourine Mountain, an interesting change from the Gold Coast in many ways. By Roger Crates. Roger has seen and done a lot in his life and he writes with humor and insight mainly about Australian themes. For more travel and humor visit Where's Roger.